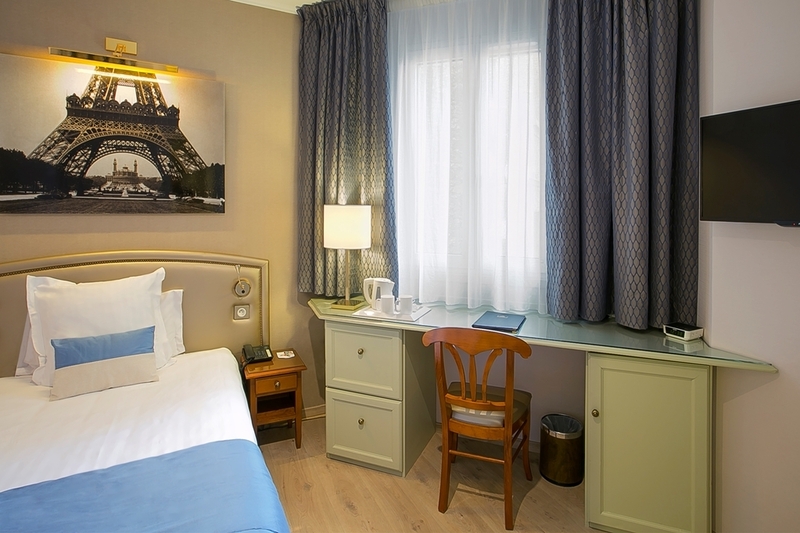 The Best Western Au Trocadero is ideally located in the center of Paris. Come and experience our hotel near the major tourist attractions. Best price guaranteed and exclusive deals. 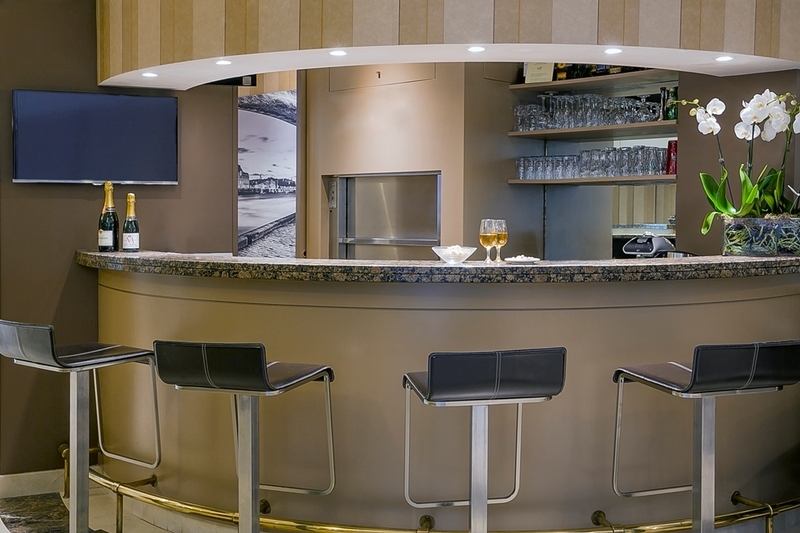 At the Best Western Au Trocadero, you are just a few steps from an unrestricted view offering a unique panorama over the Trocadero, Eiffel Tower and Champ de Mars. 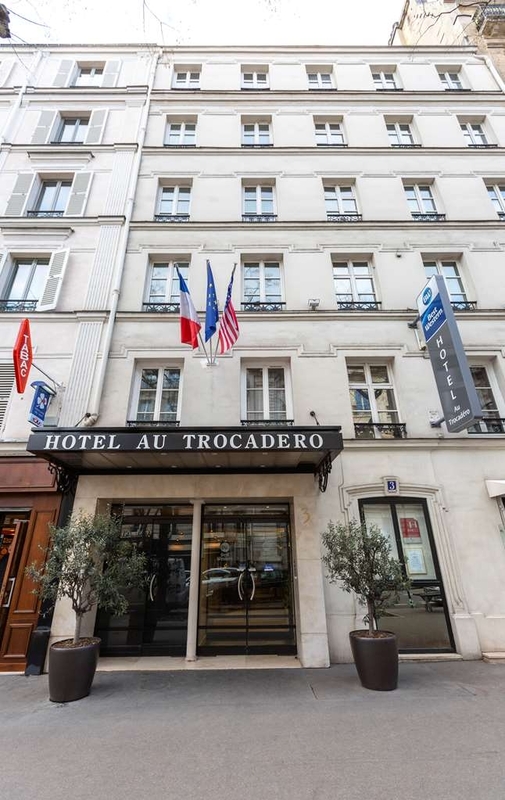 The Best Western Au Trocadero is located in the much sought-after 16th district of Paris and easy access to all major tourist points of interest and business centers of Paris. Our hotel features a cocktail lounge, theater ticket desk, fax and photocopy services. 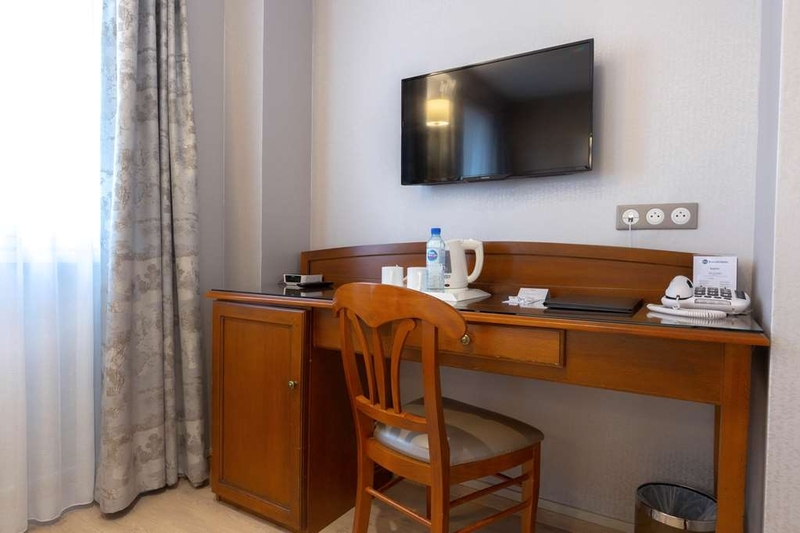 The guest rooms at the Best Western Au Trocadero are equipped with television, direct dial telephone, dataports, Internet access, coffee/tea maker, hairdryer, mini-bar and 24-hour room service. Enjoy your stay. "A perfect trip to Paris needs a perfect place to stay." Very pleasant experience. Close to many attractions, nice clean rooms, very clean bathroom and a helpful staff. Christine was especially nice. She should get a raise! The prices were very reasonable and the morning breakfast looked good though I did not eat in the hotel. Many wonderful places to eat close by. The hotel is in a great location!! Easy access to metro and Eiffel Tower! Staff was very nice!! Christine arranged a taxi to take us to the airport in the morning! The room was a bit small-- but one is not in Paris to stay in the room! The fridge was perfect and the bathroom was great with the tub! I really appreciated the kindness and overall fantastic staff! The location is perfect, 2 min walk to Trocadero Subway Station, 5 min walk to the best view to Eiffel Tower. There are some restaurants right next to the hotel and it's a safe zone to walk and be at night. The breakfast is a little bit expensive (as everything in Paris) 16 EUR per person, for an small breakfast with fruit, bread, dairy, juice, processed meat... We preferred to have breakfast in a restaurant near the hotel, we spent more, but we had breakfast outside. I definitely recommend the BW Trocadero, the rooms are nice and renovated, comfortable beds and the location is perfect! Perfect location, nice clean rooms, lovely staff, comfy beds. Big hotel room for a Paris hotel! Beautiful view of the Eiffel Tower from the room. Stayed on Valentine's Day, was met with a rose on the bed. Will stay again, looking forward to it! My wife and I had a lay over in Paris for a couple days and decided to stay here as I collect the reward points. So as typical in Europe room was very small. Free water was offered in the room but it looked as tho the bottles had been refilled by staff. When mentioned to the front desk he seemed very confused and didn't know what to do. When we went to check out we had to wait while the front desk person fixed her makeup in the mirror located in the hall way of the reception area. The breakfast attendant was amazing and very attentive.... a bit of a saving grace. So other than the great location I do not recommend staying here. We absolutely loved our stay here. 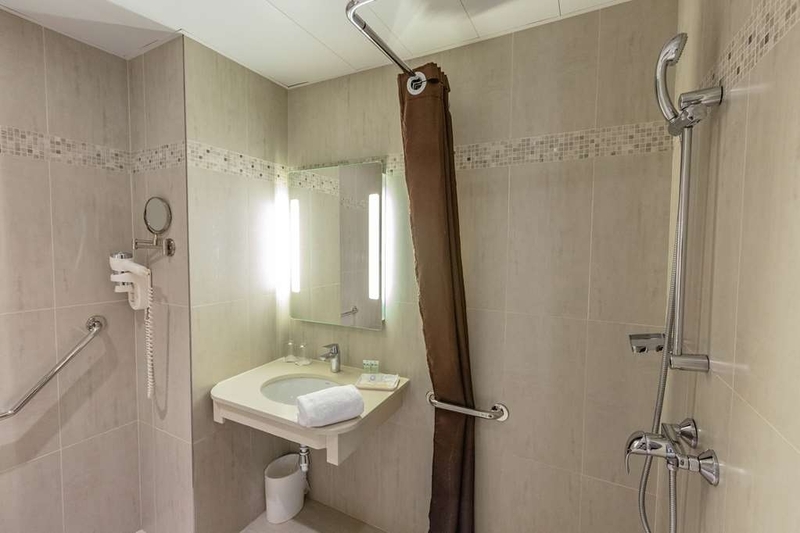 The rooms, albeit small, have everything you need; a kettle, with coffee and tea service, refrigerator stocked with drinks, a nice big closet, a deep soaking tub with plenty of big fluffy towels and even a towel heating rack! The very kind lady that checked us in gave a room with an amazing view! It was my son's first time in Paris and seeing the Eiffel Tower was #1 on his list. He slept close to the window with the curtains open, peeking at the Tower all night. We had breakfast int the morning and even though it was a bit expensive, they had an extensive spread; crepes, viennoiserie, butter, jams, coffee, cappuccino, tea, hot chocolate, eggs, sausage, deli meats, olives, juices, etc. You couldn't beat it for convenience and taste. And right outside is the Metro, waiting to take you to all of Paris. A block or two behind the hotel there are various restaurants, post office, supermarkets - basically everything you need within a few steps. Perfect location! Given our excellent stay, we will be sure to return - you really are the "Best Western"! I like the hotel location as it is just in front of the station and too many options to dine in and there are supermarkets nearby. I requested to provide us the room with Eiffel view and lucky that they were able to arrange. Staff are courteous and accommodating with our needs. The hotel has an elevator which I was very cautious prior to booking. But what I missed to check was the transportation from CDG to the hotel as I found out that there are some station which do not have a lift even the Trocadero station and we have 3 luggage's with us plus a child ☹ It was a big hassle so I suggest to get a taxi or book a car transfer for your utmost convenience. The room rate is reasonably price. We were able to walk back to the hotel from Eiffel tower with no fuss and it was wonderful to cross the bridge and the museum during this winter season. My stay in Paris began at another BW property but an issue with their hot water led to my being moved to this hotel. Couldn't have been more pleased as it quite a bit more spacious than the place I started. Location can't be beat. 2 minute walk to metro and Eiffel Tower viewing, supermarket and a large choice of restaurants within walking distance. The staff were very friendly and helpful. Stayed for 7 nights and repeatedly had to ask to replenish the tea service in the room but that was the only issue I had. Breakfast buffet had some hot items which was nice. We stayed for a couple of days and the view of the Eiffel tower from our room was amazing. It's fairly small room BUT lacks nothing. 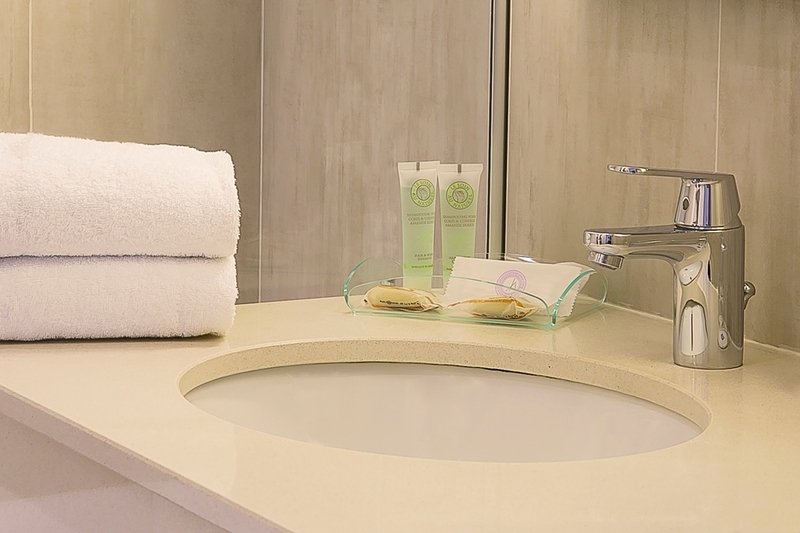 Every single thing you need for your stay is available. Closet space, good size desk, and the bathroom is very comfortable. It has everything from a towel warmer, clothesline and even a magnifying mirror. The place delivers what it promises -- great location, fairly low price, perfectly okay service and cleanliness. The rooms are a bit small for a family, but great for a single person or couple. Walk away from the Eiffel Tower for better prices in cafes, but of course the Eiffel Tower is the main attraction for us tourists. The hotel was very clean and tidy and with a very helpful front desk. Yes it was small but fine for sleeping and a good price compared to the others. The breakfast at €16 was wide, varied and fresh, much better value than the neighbouring Brasseries. Agree with all comments on best view of Eiffel Tower and very near to Metro stop. The Hop on bus stops there also. 15 minutes walk to Champs de Mar metro for the RER train to Versailles - all too convenient! We bought a two day Hop on and off bus ticket with Batobus boat - saw all of Paris, great for orientation. The hotel and its location made this a perfect short sightseeing trip. Beware of the queues even in late October. Its just right in front of the eiffel tower. Perfect location. 15 minute walk to champs elysees. Basic hotel but in a very good location. The restaurants around the hotel were open till 3 am , so very safe. So if you just need a hotel close to eiffel tower , this is it. For two nights , i just saw one person at the reception , however they were very helpfull Good Value for the location. "Beautiful stay and perfect location!" Me and my partner stayed in here for our weekend away. The receptionist was lovely and helpful! We were the perfect distance from the Eiffel tower, you can see it from a perfect view without being right under neath it. The room was lovely and there were a couple of nice restaurants around. There was a metro station right outside and all cabs we used were very cheap to wherever we needed. I'd definitely stay again! 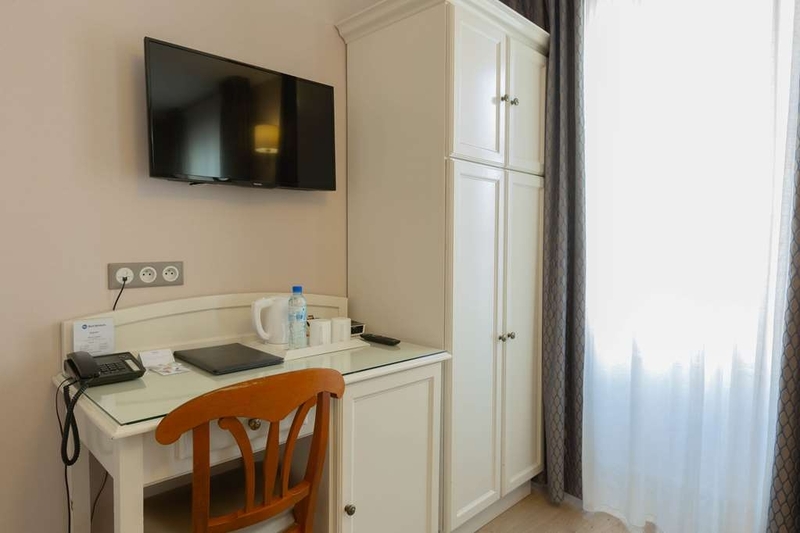 "Good Clean Rooms with one Issue"
The hotel is situated in a great location with tons of restaurants and steps away from metro and the best view of the Eiffel Tower. We were here two nights, got there early dropped off our luggage in the lobby, since our room wasn't ready. We returned late in the evening exhausted and were looking forward to a good rest BUT when we got to our room there was only one bed, our reservation was for two. They were very polite and apologetic and offered us another room. NO! I wasn't happy but my 17 year old nephew was excited to have his own room. I was hesitant since we were in a different country and on different floors, but it worked out well. We left early to Disney and returned late only to discover that they moved all of my nephews stuff to my room which they converted to a two bed room. UGH we left everything strewed all over both rooms. If they would've given us the heads up we would have gladly moved everything ourselves. I wasn't upset as much as my nephew. Other than that the hotel is clean, friendly staff and great location. The room is tiny as most of European rooms are tiny but the bathroom seemed to be a bit larger than other hotels. We didn't try the hotel breakfast we opted for a fresh pastries from a small monoprix on avenue Kleber, they were absolutely delicious. The staff at monoprix isn't friendly at all but we just dealt with it. There is also a bank next to it and the closest atm to the hotel that we found. We didn't try any of the cafes in the area but there is plenty to pick from and very busy at night. What can I say this hotel was amazing. The room was very spacious especially for Paris. Great size room and the bathroom was exceptional. 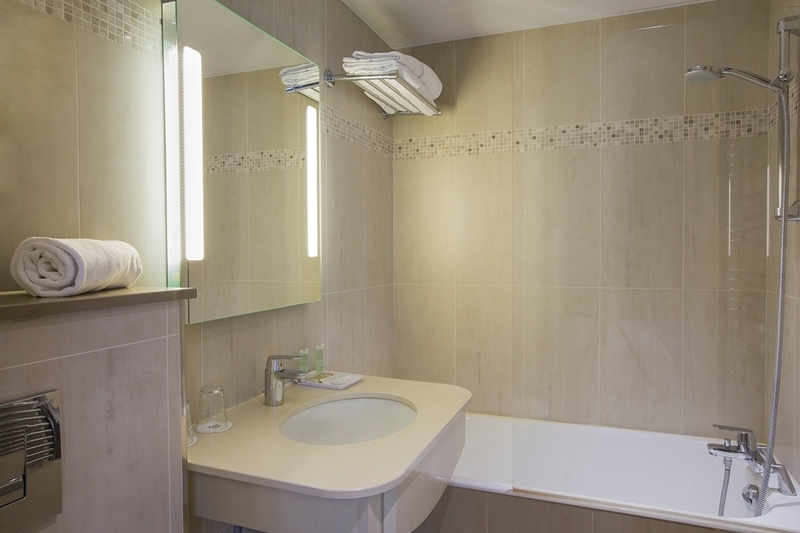 It was very clean and tidy with all amenities that you need. My room had a wonderful view of the street and the Eiffel Tower. The location was great everything was close, little supermarket, banks, chemist, hop on hop off bus and the metro was 1min away. As all Parisian hotels, rooms are small but the one we had was clean and the staff worked to the best. The Orly airport and tourism open buses stops are just across the street. Also the metro station is in the plaza. Excellent for Eiffel tower visitors. We stayed in BW for three days then we transferred to another BW in Quartier Latin closer to Notre Dame. Beautiful hotel and great service. The rooms are small but very nice with comfortable beds. I would stay here again. We walked to an area to see the Eiffel Tower in the day and at night. Very safe area with plenty of restaurants. I stayed at the Trocadero for a long weekend in May. It is a very small hotel, 5 rooms per floor on 5 floors. Rooms are clean and comfortable, albeit small but with refrigerator, good air conditioning and wifi. Staff is outstanding, welcoming and eager to ensure guests are taken care of. The Metro is adjacent so getting around Paris is easy. This is a very chic, expensive neighborhood of Paris; several "Parisian" sidewalk cafe restaurants are a stone's throw from the front door but a grocer or newsstand is not. Not sure I would stay here again, despite the wonderful staff, because I found the the price to be quite high. I stayed at this hotel from May 14 - 17, 2018 whilst in Paris on business. The staff were all very friendly and charming and were more than happy to help out with directions and questions about Paris. ?I found this hotel to be an outstanding value and you cannot beat the location. ?When you walk out the front door turn right you are on the Trocadero overlooking the Eiffel Tower. ?The rooms were well appointed with a fridge and safe and the bathroom toiletries were very good. I did not have breakfast as there were plenty of bars and cafes nearby but it looked good with a good selection. ?TBH, there are Restaurants on every corner, a well appointed supermarket, and bakery just up the street you are spoilt for choice. ?It's a 15 minute walk to all the grand shops and attractions. ?I would highly recommend this hotel to anyone who visits Paris. While it may not be a five-star hotel the services and location ranks five star. The bed was very comfortable and the air-conditioning was excellent. The room (Room 11) was not huge but Paris Hotel rooms are not large compared to some countries. Nonetheless, it was spotlessly clean, housekeeping was very good. ?I left an item of personal property in the Hotel on checkout. I contacted the Hotel and it had been found by housekeeping. The Hotel (Yacine) posted back to me in the UK - Superb service! The hotel does not offer airport transfer but the Metro is just across the road from the Hotel entrance as was the direct bus stop for the airport bus too and from Orly or CDG. I'm a very picky traveler and feel this hotel is of high quality- I will certainly return to this Hotel when visiting Paris in the future.? I stayed at this hotel from May 18-21,2018 for my birthday. I found this hotel to be an outstanding value and you can not beat the location. When you walk out the front door you are at the Eiffel Tower. There are Restaurants on every corner. It's a 15 minute walk to all the grand shops and attractions. I fell in love with the location at night to see the water fountains and that Eiffel tower lit up at night was just breathtaking. I would highly recommend this hotel to anyone who visits Paris While it may not be a five-star hotel the services and location ranks five star. I'm a very picky traveler but I feel this hotel is excellent. The hotel does not offer airport transportation outside of uber or public transportation which all right outside the hotel door. Pros: Superb location which is near to Eiffel Tower. Room and bathroom are clean. Comfortable bed. Cons: Our room is facing roadside. A bit noisy during night time. Air Conditioner (air cooler) is not working. "Not like Best Western in USA"
When I and my wife visit foreign countries, for first few days, we usually book known US chain-hotels so that we can set up the clear expectation before we arrive. For our 2-week Euro tour, I booked this hotel for the first 2 nights. We were a bit disappointed. Check the details below: Room: The tiniest room we have ever been to. When you put your luggage inside the room, there is hardly any space to walk or move. However, the room and the bathroom were very clean (3-star for that). The entrance of the hotel is very small and so is the elevator. It is not like the best western in USA. With 250 Euro per night, we would have expected way more. Comfort: They gave us a room next to the road. The hotel does not have air cooler (only heater) or at least it did not work. You have to keep your window open to sleep comfortably. However, traffic runs on the road all night long and makes huge noise (even with window closed). So, basically, our first two nights in Paris, I was nearly awake whole night. I requested the front desk to switch our room the next morning after the first night, but they informed us that no other rooms were available at that time. Service: The hotel has very basic staffs. No one will help you with your luggage. This is not a big deal for us. The breakfast costs about 16 Euro and not too bad (include meat, eggs, and pastry). Staffs were all courteous. Location: I think you can't beat the location. I gave 3-star because of the location (even though we had issues in sleeping). It is right next to the Eiffel Tower. If you go out of the hotel, you will get the full view of Eiffel tower. The place is full restaurants, banks, and tourists. It is also next to the metro and bus station. We went out event at 1:00 am at night, and felt very safe. There is always a party feeling around. If you are going for Paris and not the room then this hotel is fine. The rooms are clean and well maintained; although the pillows are like bricks. There is no ambiance in the hotel due to the size of its lobby, etc but is suitable for a short break. Our room windows opened onto a small internal courtyard which was oppressive and this may have influenced our opinion of the hotel. Not a great choice for us. Staff were friendly and professional. My boyfriend took me away to Paris for 2 nights and booked to stay at this hotel. I usually book all our trips so it's fair to say, I couldn't have booked anything better myself. We arrived quite late, around midnight, but the member of staff on duty was lovely. I didn't catch his name but very helpful. Room was lovely, bed was so comfortable! The view from the window wasn't the best but for what amount of time we were in there, it didn't matter. We didn't eat breakfast in the hotel so can;t comment on this. 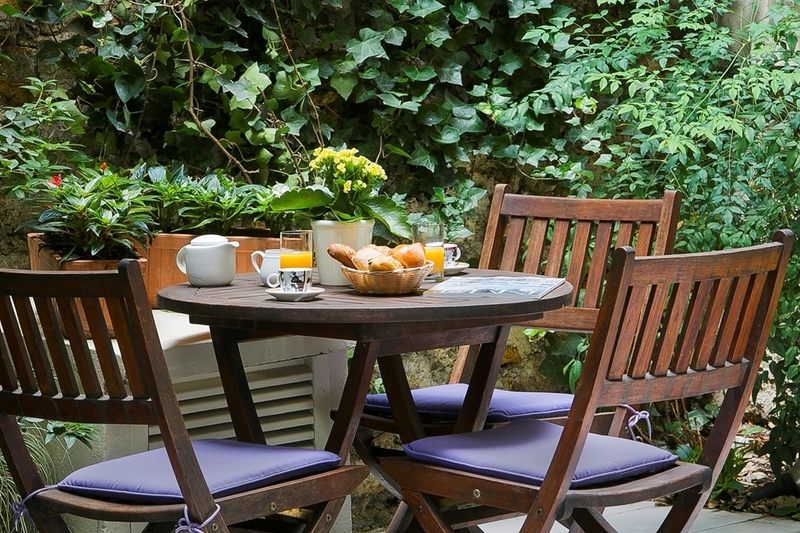 Perfect location, literally a 5 minute walk from the Eiffel Tower. There are lots of places to eat locally and a supermarket just up the road. I'd stay here again and would recommend! "Ok accommodation in a great location"
Location is unbeatable in terms of access. the hotel is located next to the metro and many restaurants including a commiserant, that's a police station; a good thing if you get robbed as is very likely in Paris. the room comfort is mediocre by Middle East and US comparison. 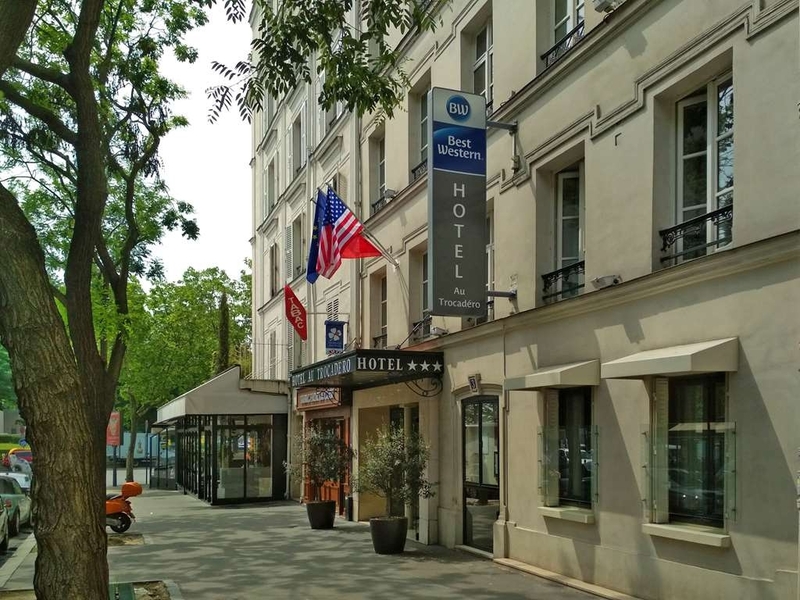 hotel is really basic and i guess value for money given the pricing in Paris but that's what it is...a nice location to crash if you are in business at OECD or within the 16th area. the hotel staff are very cold but again, there is little basis for interaction given that the place offers little else than the room. Breakfast is very ordinary but there are good eating places around anyway. "Fantastic location and a comfortable hotel." This hotel is minutes away from the Eiffel Tower and from some roo s on the street side, it can be seen. The staff were all very friendly and charming and were more than happy to help out with directions and questions about Paris. The metro stop for Trocadero was 2 mins from the hotel as was the direct bus stop for the airoprtbus too and from Orly or CDG. The rooms were well appointed with a fridge and safe and the bathroom toiletries were adequate. We did not have breakfast as there were plenty of bars and cafes nearby but it looked good. 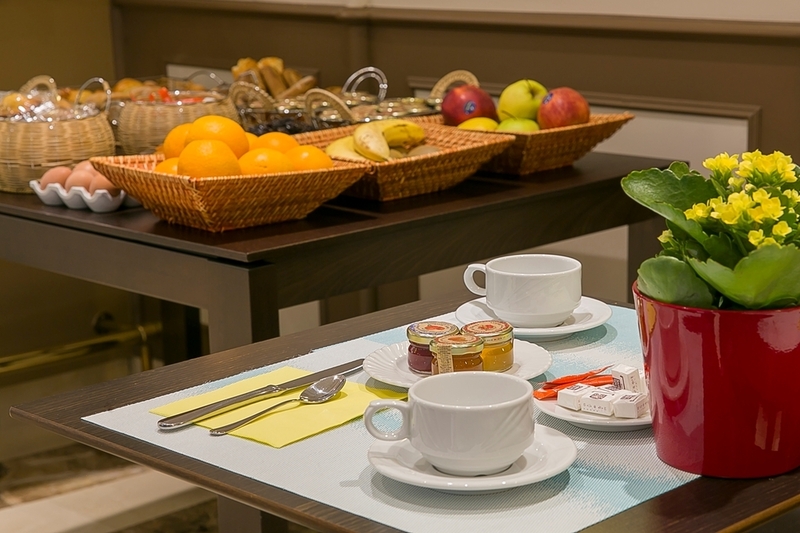 Prime location (5 mins from Eifel tower), kind staff, OK breakfast and super comfortable bed. They have a partnership with a taxi company so they get better prices. My one-bed romm wasn't too big, but OK for a business trip. "A trip with my daughter"
I use to stay in this excellent little hotel every time when I am in Paris. 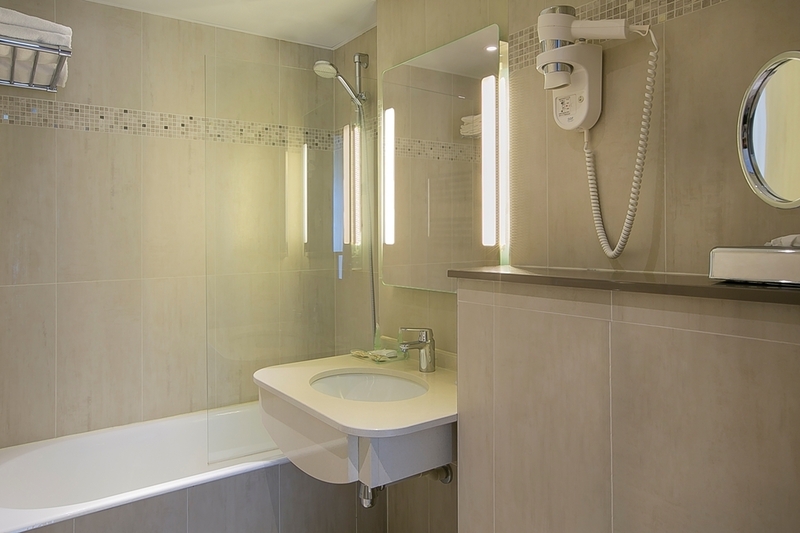 Perfect located in a very nice area, close to attractive museums and the Eiffel Tower. Service is excellent and prices are reasonable. Nice for business but also for family visits. The Au Trocadero is located in a great location full of restaurants and bars and very short walk to great views of the Eiffel Tower. The reception staff was welcoming and provided a good service. The room was clean but is in need of renovation and was small but this is normally expected in Paris. The view from the room wasn't great (see pics). There was a kettle in the room and a desk to work at. The Wi-Fi was free and worked okay. The bathroom was clean and functional. Okay for a night or two for my business stay. Hotel has very bad service and very noisy neighbours. Starting 10 at night we had neighbours partying very loudly - screaming, dancing, jumping. We told the 'only' person present at the hotel he said it's not his problem and he cannot do anything to us. We even called the police to complain since it is illegal to make loud noise at night. We had to endure the sounds until 2 am when the party was over. We didn't expect the hotel to be so careless about its clients well being. We will definitely leave next morning. Hotel bathroom needed some repairs. The mattress was in poor shape too. The curtains let in too much light into the room. Otherwise service was quite good, and the receptionist was polite, and the room was clean. The hotel is superb and so closed to the Eiffel Tower is worth every penny. If you want to visit Paris and you don't have or don't want to spend lot of money here is where you want to stay because the hotel is very clean and the staff is very accommodating. I would stay here again. Thus is an amazing place to stay. So close to the metro Eiffel tower, cafes and there's a monoprix around the corner. The bedrooms are new and comfortable and the staff are so helpful and friendly yet it is so affordable. Thus is my new hotel to stay every time I go to Paris. Loved the location from the subway, cafes, the Eiffel Tower , loved the hotel, loved the staff, loved the cosy hotel room, however the climate air vent was caked in dust. I did make this to the front end staff which I hope it will get cleaned. Overall, it was a great stay. This place is located less than 100 meters from a metro station, and also less than 10 minutes' walk away from the Eiffel Tower! Rooms had good AC, staff were friendly, was close to many bars, restaurants, cafes, and convenience shops. "Best Western Au Tracadero Hotel"
We booked 2 rooms at this hotel in July 2017. We found the Staff to be very friendly and helpful in every way . Breakfast was not furnished but with good bakeries close by that did not make a difference. The rooms were small but typical European. They were clean and modern. We could see the Eiffel Tower from our room. I knew we were close to the Eiffel Tower but was surprised how close we were when we got there. We were also close to bars, restaurants, a metro station and other attractions . We enjoyed our stay at this hotel and definitely would stay there again . Room was very small and basic for the money, no fridge but ice available on request. Easy walking distance to Eiffel Tower and excellent view of it close by. Close to several cafes and restaurants and small supermarket, close to public transport and hop on hop off buses. We stayed at the Best Western for 2 nights in June 2017. Took the Eurostar from London then a taxi to the hotel. Taxi cost 20 euros to hotel. Location is very convenient to the Eiffel Tower and there are quite a few cafes nearby. We had a room on the 3rd floor. The room was old, small with a small bed. The bathroom was surprisingly large and renovated. Overall it was clean and had a/c. You could see the Eiffel Tower at night from the room. We chose this hotel for the proximity to the Eiffel Tower and enjoyed going up to the top and seeing the magnificent views. We also walked the next day from the hotel to the Arc de Triumph and then down the Champs Elysees to the Louvre. We ate at the cafes near the hotel and enjoyed good food and service. The staff spoke English and overall the hotel met our needs for our short visit. "Good but few security issues.. No AC, Wi fi down one day"
"Very Disappointing All Round but Great Location"
Dreadful room, tiny with poor amenities. Bathroom impossible to move, poor air conditioning, minibar did not work. Tiny hanging space for clothes. Awful breakfast and intermittently working internet. Only on English TV channel, and unable to view the screen as it was at a weird angle on the wall. Minibar only replaced only replaced once in three days. Keys always losing their memory needing to be reprogrammed frequently. Suitable for tourists/groups with low expectations, definitely not for business travellers and would not stay again. Hey there, If you are looking at enjoying Paris but don't want to be right in the middle of the city this is a great choice. At the end of the street there are 3 lovely restaurants/cafes with the perfunctory sidewalk tables. Ahead of that is the beautiful Museum of Architecture and Monuments. Then you look around the corner of that building and you see the Trocadero Gardens, the Eiffel Towers and down the Champs de Mars. Great position for walking the city. There is a very close Metro station. 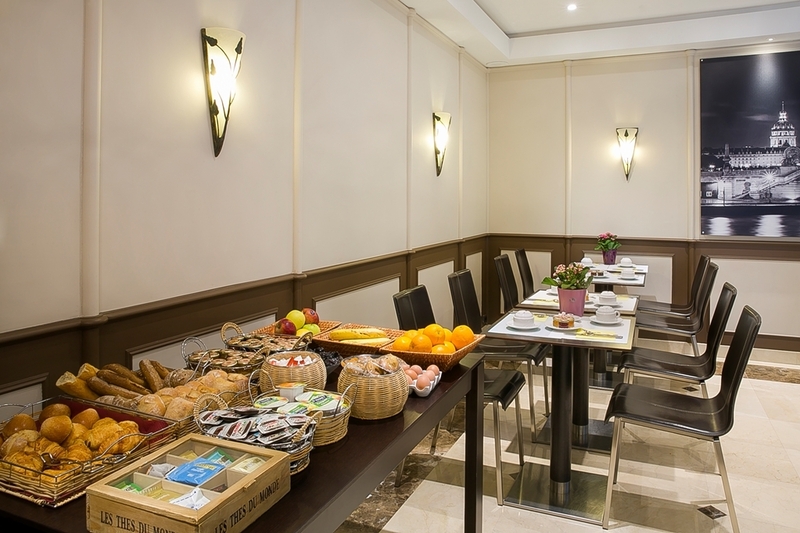 The hotel is small as most are and the continental breakfast is a good way to start your day. When I checked in the 2 gentlemen working the desk were very helpful and knowledgable. 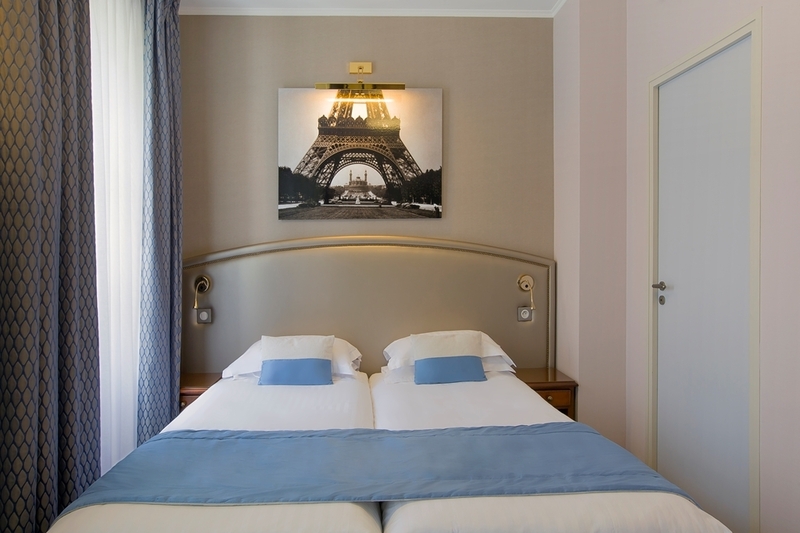 Great hotel located very close to the Eiffel Tower with awesome views of the tower itself. Hotel is well maintained and very very clean throughout. Room was very nice and spotless and just perfect for a short stay in Paris for a couple of nights. Free wifi offered throughout the hotel which works very well. Staff are very friendly and pleasant. 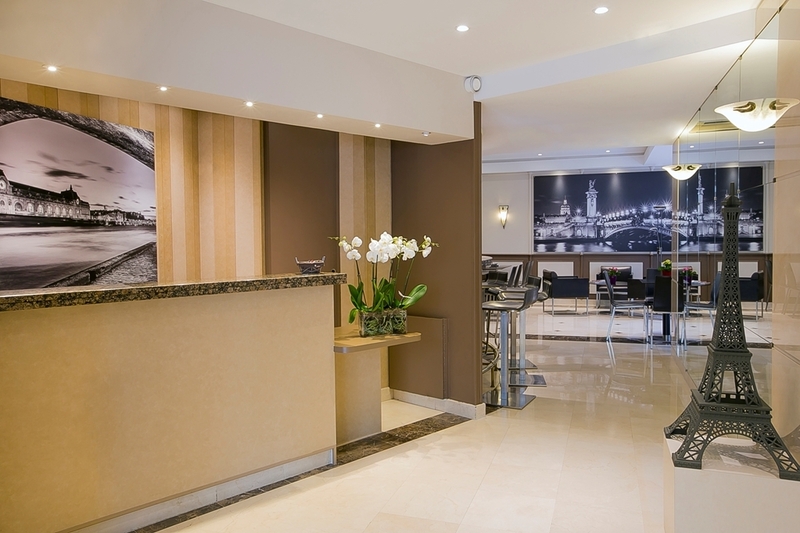 Hotel is located in nice safe street with Metro is located just outside the hotel so easy access to the whole of Paris. There are plenty of bars, restaurants and cafes in the vicinity. Definitely recommend this hotel for anyone visiting Paris. This hotel was a perfect location for visiting Paris. The Eiffel Tower is right there along with shops and cafes. The tricameral bus stop is literally next door. We took the bus from the airport and it was easy because we had big luggage. It was a very convenient place. Staff was friendly, and I forgot my electricity converter, they have them at the front desk for you with a deposit. Fair warning, the rooms are tiny, not a big deal for us but could cause issues for tall or bigger people. Would stay here again for sure. This hotel has an awesome view from room 32 I believe. The room itself was very clean and I loved it. The location is exceptional! I was able to look out of my window and had a view of the Eiffel Tower. The price for a double bed was nothing for the view. I felt like I was in a 5 star hotel. The people were lovely and very attentive. I did not eat their breakfast, but it looked lovely. I wanted to go out and eat for breakfast, nothing against hotel at all! I will stay there again; I already have planes to go back. "Cozy hotel in a great location!" This was our first trip to Paris so we booked this hotel based on the price and location and we were not disappointed!! The hotel is small and quaint, as are the rooms (by US standards), but they are very efficiently laid out so we never felt cramped. There was plenty of storage space and the typical amenities (flat screen TV, room safe, desk, kettle, toiletries), plus a few unexpected ones like a towel warmer in the bathroom! The staff were all very friendly and accommodating and thankfully for us, they spoke English! I had called prior to our trip to request a room with an Eiffel Tower view and was so grateful to get it. It was amazing to look out our window and night and see the lights of the Eiffel Tower twinkling on the hour. The hotel is maybe a 10min walk across the river to the Tower, but is literally across a traffic circle from a plaza where you can get some amazing views/pictures. The hotel just steps from the Trocadero metro station which was so convenient. So while this hotel is not super close to other major landmarks, we had no problem hopping on the Metro to the Louvre, Arc de Triomple, Notre Dame or any of the other spots. There are 3-4 cafes right on the traffic circle and we found a chocalatier, boulangerie and several markets within a few blocks where we could get pastries, sodas, fruit, bread and almost anything we wanted/needed. 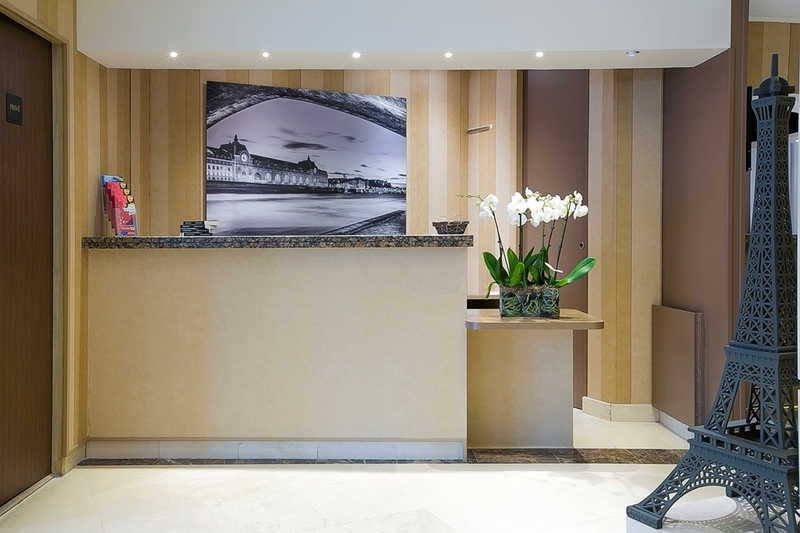 This is truly a wonderful hotel that I would recommend to anyone visiting Paris. 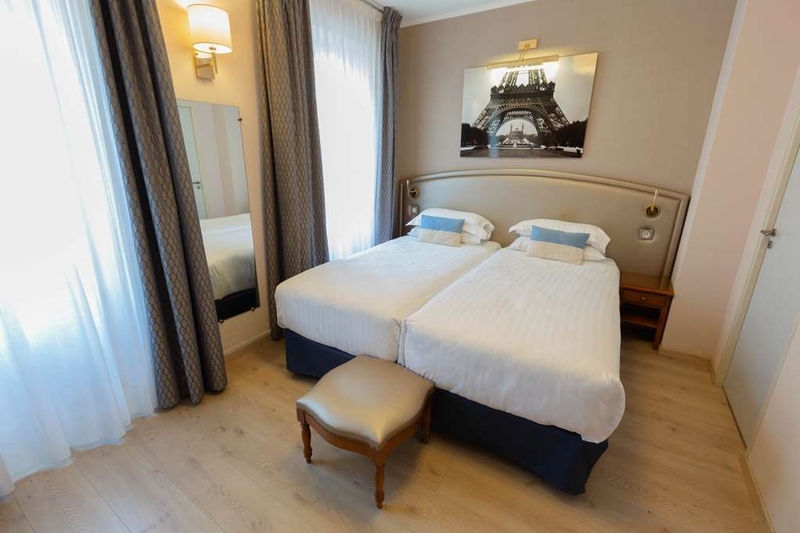 "Great location with good rooms"
I picked this hotel as it was near the Eiffel Tower and nearby family. The location was better than I expected: walking distance to the tower, great restaurants, ten steps to the Metro and Paris vibe. We will return. The room was small, but that was expected. Modern features and friendly staff. Once again, I realize how sad it is to live in LA without a wonderful subway system as exists in Paris! "Extremely small (yet cozy) rooms but extremely convenient location but - overall very good!" 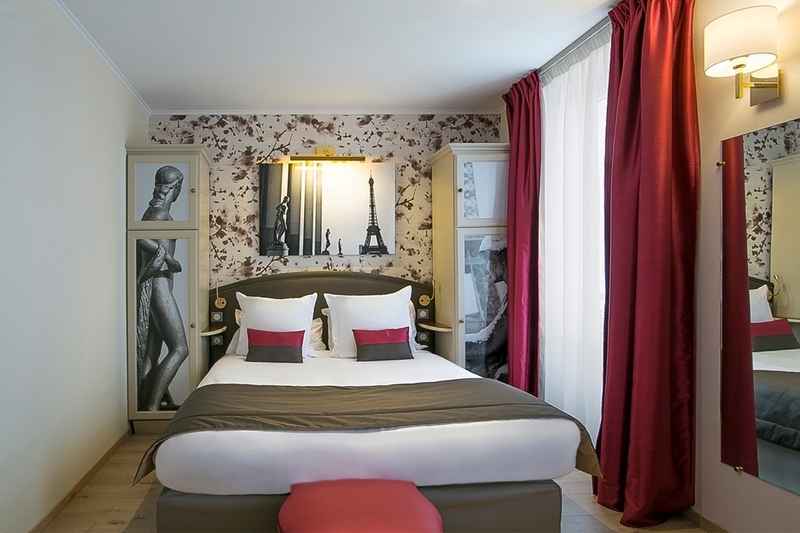 Near the Eiffel Tower and the subway station, plenty of restaurants and bars around, could be perfect for a romantic (economy class) getaway, Very small rooms which however is a common practice for most of Paris hotels. Poor breakfast. Could consider staying there again though. Traveled with 20 year old daughter to prepare for check in to study abroad dorm. We arrived at hotel at 11:00am from long flight and we're thrilled we could check in EARLY! Room is standard double on courtyard and we love the private courtyard view, and quiet. Only about 4 rooms per floor. Tea kettle, fridge, and two small wardrobes nice. Bathroom fine. We found the pillows and beds to be comfortable and air conditioner works well. Front desk is so amazing! Helped with recommendations were to eat, parks less crowded, and even a bit of French history. Location is the key though and easy walk to many attractions and metro. We took Air France Shuttle from airport and just 3-5 minute walk to hotel. I am returning here with a single room in two weeks. :) we did not do the breakfast. "Quiet, charming hotel, perfectly located"
Our double occupancy room was extremely clean and comfortable; not overly large, but definitely a place to put everything. The staff were unfailingly courteous. The hotel was so quiet, we almost thought we were the only occupants. The location couldn't have been better at just a five minute walk from the Eiffel Tower, across the street from a metro entrance, and surrounded by charming restaurants and cafes. 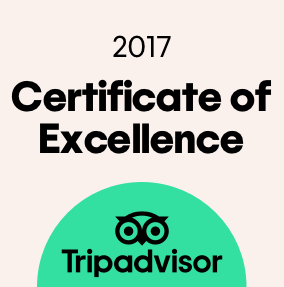 The staff was helpful ad friendly, we had a great view of the Eiffel Tower from our room, and the location is great for sightseeing, including Versailles. The strikes affected the RER train going to Versailles during our visit, so we took the Metro very easily from the hotel and were able to transfer to the bus (Paris by Train had great directions) with no problem. I only had two days in Paris and had no idea where to stay. I found this hotel by chance and it was perfect for me. It is right off Trocadero Circle with a metro stop and nice restaurants steps away. It is very close to the Eifel Tower, Seine cruises, etc. The staff spoke English, and were extremely nice. They even let me use their office to change clothes (I had checked out in the morning and went site seeing) before catching a train in the evening. The room was small but it was very clean, quiet, comfortable and was all I needed or wanted. This is a great hotel if you're a tourist and plan on being out and about. If I get the opportunity to return to Paris, this hotel is going to be my first option. Quaint, no frills hotel that is all about location. 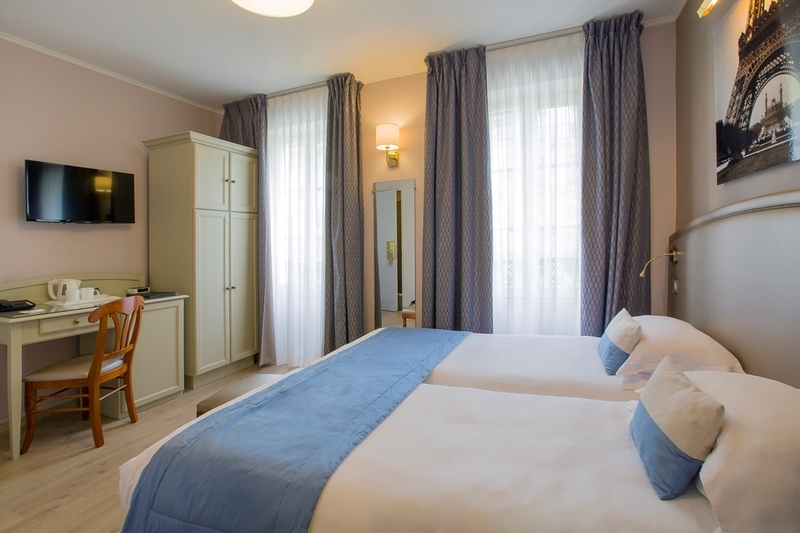 Right across the circle from the Eiffel Tower and easy walking distance from the Louvre, a perfect place to stay and see all the sights in Paris. I stayed in a single room that was plenty comfortable for the little time I spent in it. This hotel is all about location. The Metro station is right across the street in front of the hotel, the Eiffel Tower is a 5 minute walk, and the Arc de Triomphe is about a 10 minute walk away, or a stop or two up the line on the Metro from the station outside the hotel. The rooms are very, very small but that was to be expected, and they are nicely furnished and updated. The size was perfect for a couple of days for 2 people, but if we had gone with the whole family and stayed any longer, we may have looked for a hotel with larger rooms. The lobby and common areas of the hotel are almost non-existent, but who really wants to spend time in their hotel in Paris? For a quick stay in Paris, this hotel really can't be beat. 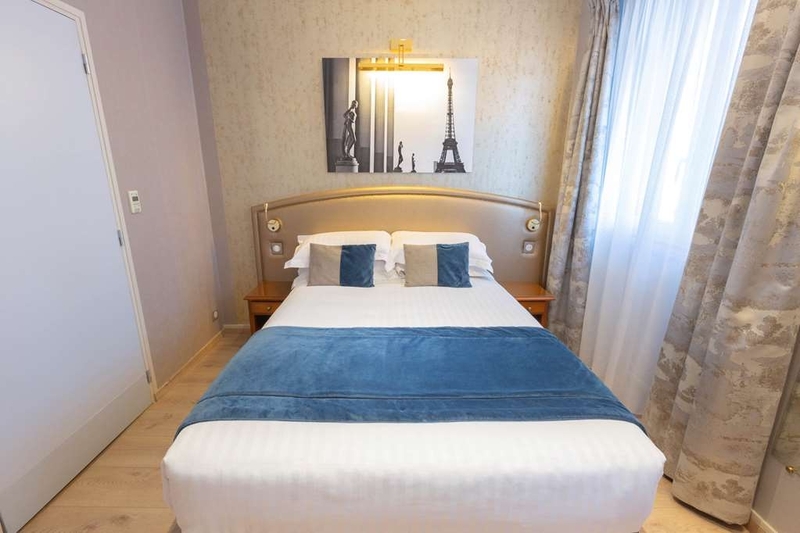 Perfect location; 5 minutes walking to the Effeil tower and other tourist attractions... the metro is just in front for the different transport connections... restaurants and cafes around. Price is good for the area... very clean too... free wifi also. "Good location, but poor service quality"
The manager promised of complimentary breakfast service due to some inconvenient and unsafe service in the room, but soon denied to do so for odd reason. The door of bathroom was unlockable so that my baby could keep trying to come inside that we couldn't wash well because we had to keep watching him not to come inside. The cleanliness of the room was also questionable as well. Size of the room is super small. "Very good location to explore paris"
I stayed here some time ago the hotel itself is fairly basic but being so close to the metro (about 100m) and a 5min walk to the Eiffel Tower it was perfect for what I wanted. The views from out the front and window were good and if you go outside there are also plenty of cafes etc really close. I had breakfast and dinner in the cafe that's literally outside this hotel and it was really nice. Probably the one place I have been where I can just sit and watch the world go by. I reserved 2 rooms for 6 nights at this hotel in April, 2016. Each room had a double bed, a mini bar and coffee maker. Each room was well organized and clean. Room 42 had a view of the Tower but room 41 did not. The buffet breakfast included pastries/rolls, different cheeses, various fruits, bacon, eggs and sausage. You can walk directly from the hotel to the Tower(@ 800 meters). Within 2-3 blocks of the hotel, there are many restaurants/sidewalk cafes, a grocery store and tour bus stops. Everyone on the hotel staff was very friendly. We give a special thank you to the 2 ladies working at the front desk for their help. We give an extra special thank you to the hotel manager, Mr. Yacine, for his help in making our stay so enjoyable. He is a true asset to the Best Western chain. 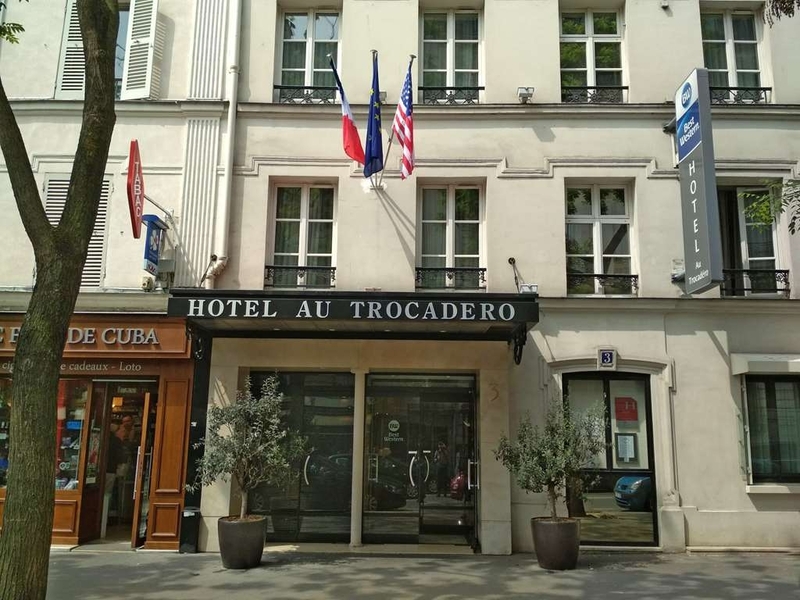 When you consider the location, the price and the staff, I highly recommend the Best Western Au Trocadero for anyone in need of a hotel in Paris. Stayed here over the Easter weekend and glad I did. The hotel was clean, comfortable and the staff were lovely. My daughter and I were in awe of the lovely view of the Eiffel Tower from our window. The area is really nice, surrounded by lots of nice restaurants and all amenities. The Eiffel Tower is a 5/10 minute walk and there is a stop for the hop on hop off bus which we really recommend as you get to see the whole of this beautiful city. My only disappointment was having to leave, I will definitely be returning at the next chance I get. "Three star hotel centrally located"
"For a one night stay it's adequate"
Stayed 1 night in this centrally located hotel. The room was small but clean and it was facing a wall at the back of the building so the view wasn't up to much and quite oppressive. Staff were friendly. Even though the advert states that the hotel has parking this is in a building in the next street so be prepared to haul your luggage. We opted not to pay 16 Euros for breakfast, just cross the street and you can get a better choice for 12 Euros. "Excellent location, but a tiny room"
Nothing new when it comes to Paris. You'll be located in a small room and everything is microscopic. Those booked online include no breakfast, but that's fine as the place is surrounded by patisseries etc. Any pain is alleviated the moment you walk out and see the Eiffel Tower right in front of you. The staff are extremely nice and helpful. That gets all five stars. They will make sure you find what you need and organise your stay, if requested. The walls are paper thin, so you'll hear the TV set next door, even louder talking. The room I stayed in looked to the backyard, so I didn't get much outside noise, luckily. The hotel has no gym etc. You'll just have to hit the Seine and run along its banks. There are no facilities other than the rooms. It's an overnight with a great view in the morning as you head into town. Compared to its competitors, the price is relatively reasonable. You may wish to stay or you can continue shopping around - either way you won't make a mistake. "Disappointing Customer Service and Room"
Room was not ready until 2 1/2 hours after confirmation check in time. Request for upper floor ignored and received ground floor next to lobby. Room ventilation not good so slept with window open; shower splashed water all over bathroom floor. Location near Eiffel Tower and Metro is good. At 200 euro per night in late October, not good enough value considering the above. I will use other nearby hotels in the future. It was perfect for us as it is very close to a metro station with connection to four directions. It is also very close to the Eiffeltower and a Hop On stop of the Big Bus. We had two rooms on the fith floor, one to the back which was quieter but without view to the Eiffeltower and the other one with a great view but a bit noisy because of traffic and the cafes near by. Both was fine for us. The rooms have an acceptable size considering price and location and they are clean. The staff was always friendly and helpful. "Do not stay here!! Horrible customer service"
I booked a room seven months ago and upgraded to a double room so I could have a view of the Eiffel Tower. I had a confirmation email saying I would have a view of the tower. After arriving I did not get a room with the view promised ( I had no view of the Eiffel Tower) and they would only comp me a really bad free breakfast. That they normally charge 16 euros for!!! Which it isn't worth 2 dollars. They told me I couldn't change rooms because they were booked and I had to pay the price for the double room even though the only reason I booked it was for the view that they confirmed. They did move me the next night into a room with minimal view of the tower ( the best they could do on short notice, apparently seven months isn't enough) which meant packing all my stuff up and unpacking again immediately not what I want to do on my vacation. After emailing the general manager the response I got was that those rooms even though one was promised to me were allocated to people staying longer than me and therefore deserved the rooms with a view!! "Know that the two classes of room are VERY different." The large rooms with patios are apparently very nice. The rooms without views are extremely small and of remarkably poor quality. The standard room had only a very small wardrobe with no drawers, made of compressed fiberboard, and unpainted on the inside. It looked like something I built in high school shop class. The only place to put the suitcase was behind the door, blocking the door opening. 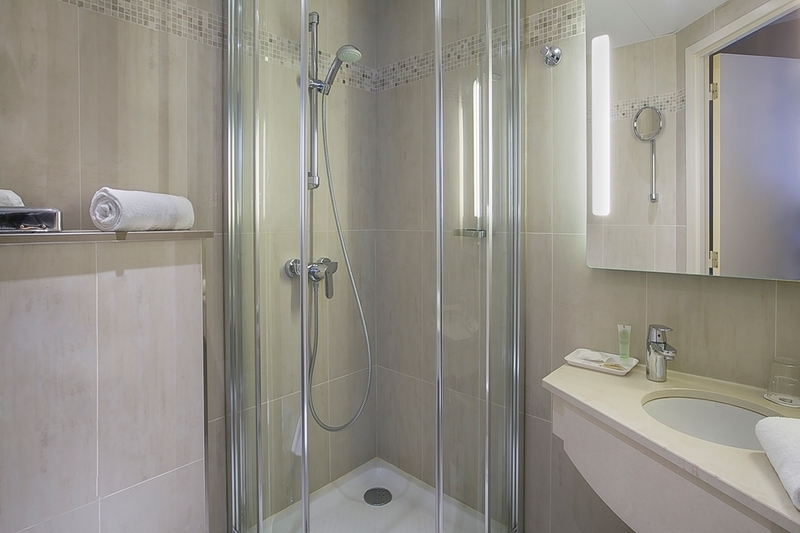 The bathroom is tiny, with a strange glass flap enclosing half the tub when you're taking a shower. 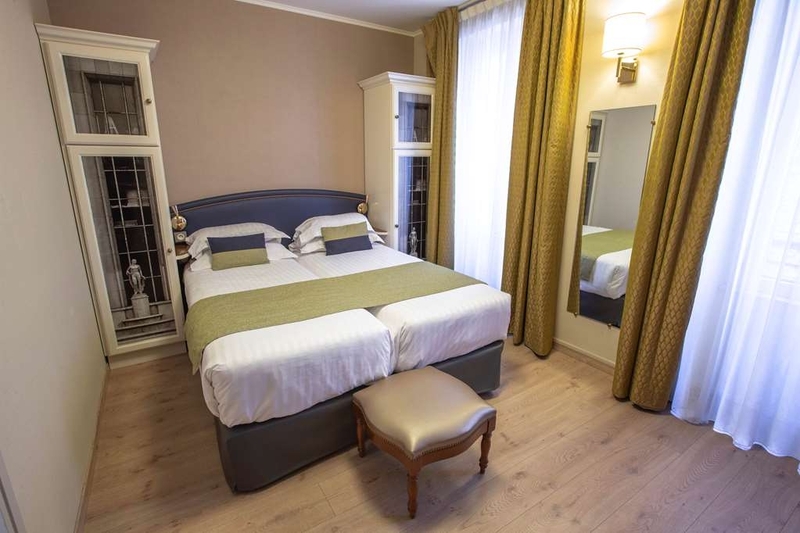 The location is excellent, a short walk to the Eiffel Tower, literally steps from the metro, and with several cafes within a block (including three within 100 feet of the hotel). This hotel is situated 10 minutes by foot to the Eiffel Tower. The big bus tours are around the corner and a cross the street . I highly recommend the big bus tour to see the city of Paris. The tour will last approximately 2 hours and is well worth the cost. I recommend you precook this. You can jump on and off and have your choice of day or night tours and 1 or 2 day durations. It's a convenient location with lots of restaurants to choose from at the door step. If you enjoy the odd cigar then you will love this hotel because there is a cigar shop next door. The staff is friendly and speak English. If you want breakfast it will cost you 16 euro. Save your money because there are lots of restaurants near by to eat. The rooms are small by North American standards but this is Europe "France" it is expected. Our room was clean and very nice. I highly recommend this hotel. Stayed here for 4 nights. Great location! It's right across the street from a Metro station. Free WiFi and Clean rooms. The shower was small but functional. Had a Cute patio area just off the breakfast area. Staff was friendly and helpful. Cafes and a grocery store nearby. Naval museum and great view of the Eiffel Tower across the street as well. Would stay here again. This hotel provides good value and a great location when visiting Paris. Although the room for 2 was small by U.S. standards, it was well furnished and efficiently organized. There was a small wardrobe to hang up clothes, but no dresser so we had to live out of our suitcases--this was OK for 2 small suitcases. 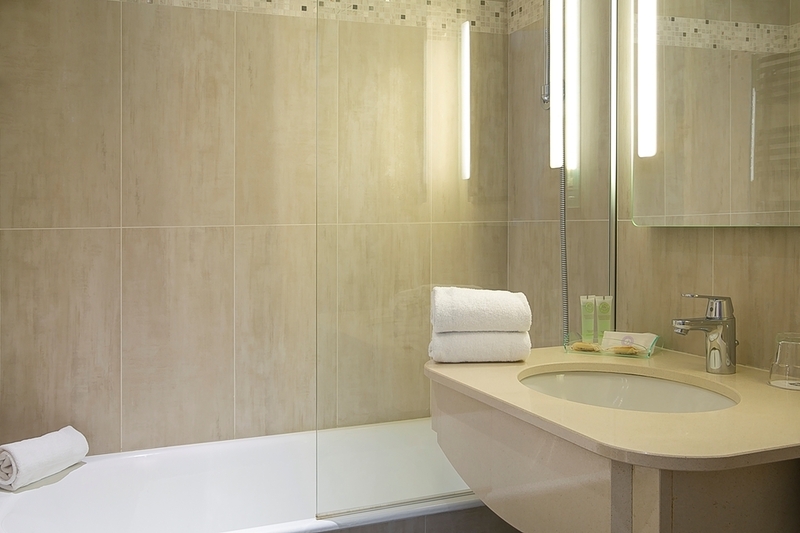 The bathroom was modern with very nice features, e.g., heated towel rack. Hotel staff was very professional, friendly and most spoke English well enough to be helpful. Free Wi-Fi in the room worked well. The hotel is in a nice location--embassies, businesses, residences--so there are nice restaurants, drug stores, boulanger/patisseries, etc. within short walking distances. Metro is 1 block away, Eiffel Tower is in view from the hotel, Arc d'Triomphe is a 10 min. walk. Few tourists in this neighborhood until evening when busloads show up to see the Eiffel Tower lit up. I would use this hotel again. Great location! 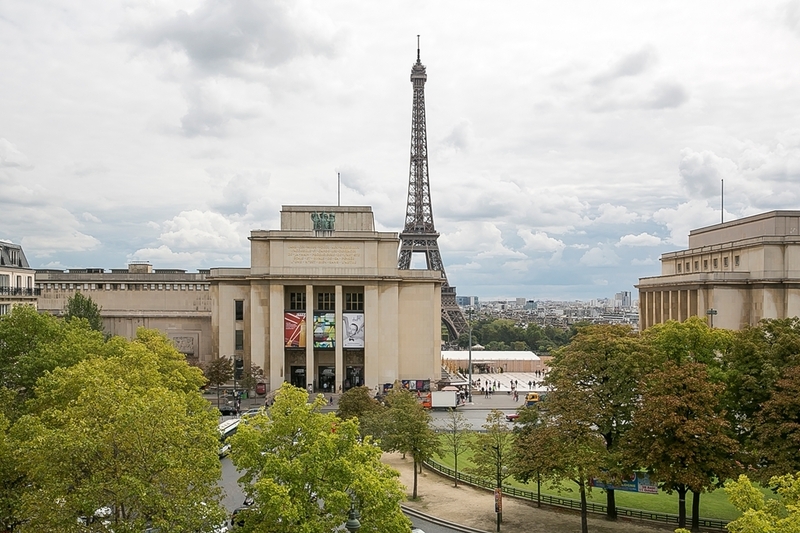 A few steps away from restaurants, there's a grocery shop nearby (monoprix), 5 minutes walk from Palais de Chaillot very convenient of you want to see the Eiffel tower day and night! 2minutes walk from the HoP on Hop off bus stop. Comfortable beds. Clean Bathrooms. Our room was facing the street a bit noisy during daytime but we didn't had any problems at night but if you're a bit sensitive with noise maybe ask for a room facing the courtyard. Breakfast was 16 euros but we didn't had breakfast at the hotel. A lot of restaurants nearby around 7.50 to 12 euros for breakfasts. Room very small but it's normal in Europe maybe a problem for big people. "Great Location Better Value Newly Renovated"
We have stayed at this hotel before and were not let down by the recent renovations. 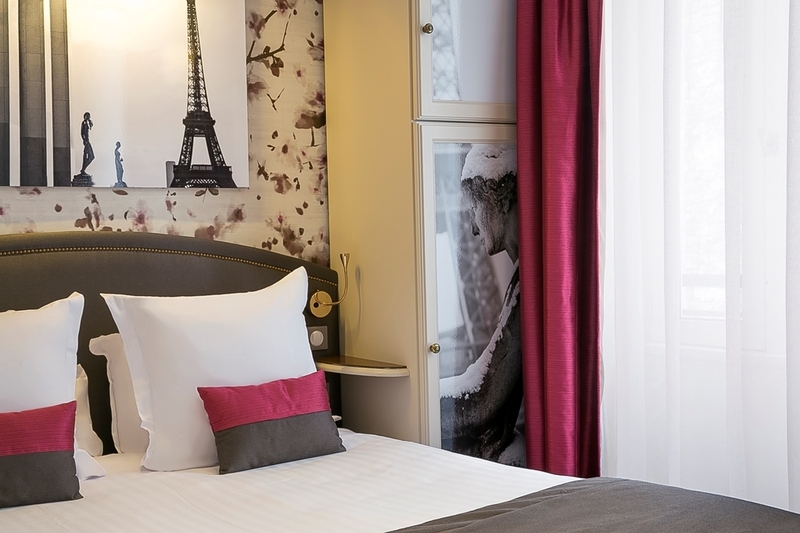 Clean lines, comfortable rooms and a great value right on Trocadéro. Staff was helpful (Christine was very nice!) and courteous, breakfast was a better value than most hotels in the heart of the city. Great restaurants are just steps away and the Métro is just across the street. Rooms are clean and well maintained. The front desk reserved our cab to the airport. Rewards Points are no hassle here. The refrigerator in the room was good-sized and ice is available from the front desk. Wifi is free and strong. Pricing of the rooms makes it a great value. This will continue to be a preferred location for us! "Ideal Paris Location & Great Value!" This hotel is in a great location for the viewing area of the Eiffel tower and for the Hop On and Hop Off stop. So many Restaurants are nearby, a small market for water and other ementities. It is just perfect!!!! We will definitely stay again on our next visit. This location was very convenient to the Metro and had a great view of the Eiffel Tower. Staff was excellent and took care of all our needs. Room was clean and comfortable during our stay. The bathroom was great with a shower and tub for soaking after a long day of walking.The room could have been a bit larger as our luggage had no place to be stored which meant it took up usable space in the room. This hotel is in a perfect location for a trip to Paris. The Eiffel Tower is visible from the front door, there is a Metro station ten meters away and lots of nice cafes and restaurants. The hotel was clean and comfortable, the room was spacious and the staff friendly.